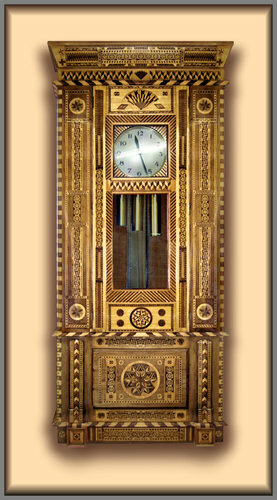 Details about this beautiful Australian made Grandfather clock were recently brought to our attention. It was made by H. B. Mason who was considered by his peers to be a "True Master Craftsman in Art Cabinet Making" - and judging by the standards presented here, they were not amiss in that estimation. 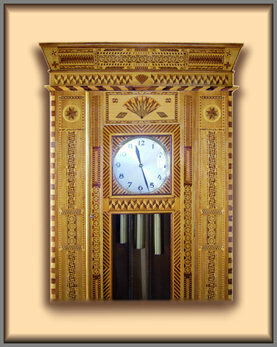 This particular clock contains up to 20,000 separate pieces taken from some 33 different varieties of veneer! Quite a feat of work we think you'll agree! In all, Mr Mason made four Grandfather Clocks, and we're pleased to say, each and every one of them found good and prestigious homes in their country of origin Australia.